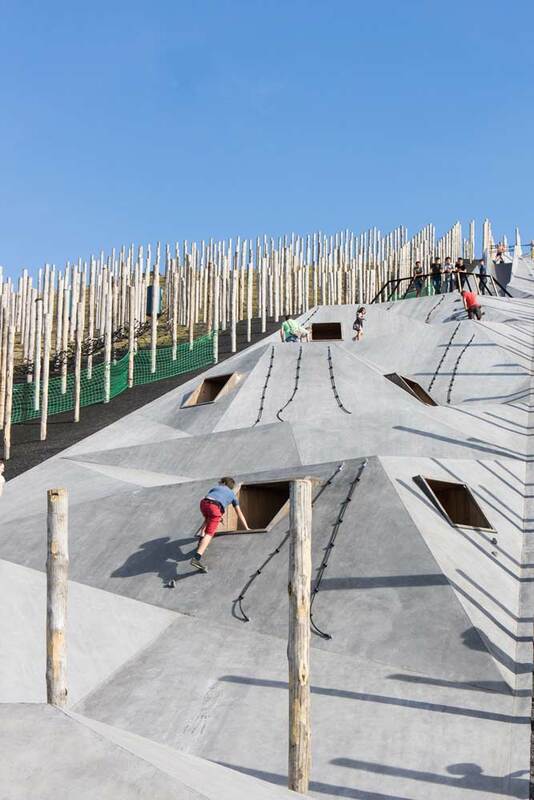 The team of Carve and Omgeving (design) and Krinkels (contractor) won the international competition to design an adventurous play-scape and landmark on a ‘terril’ in Beringen, Belgium, in January 2015. 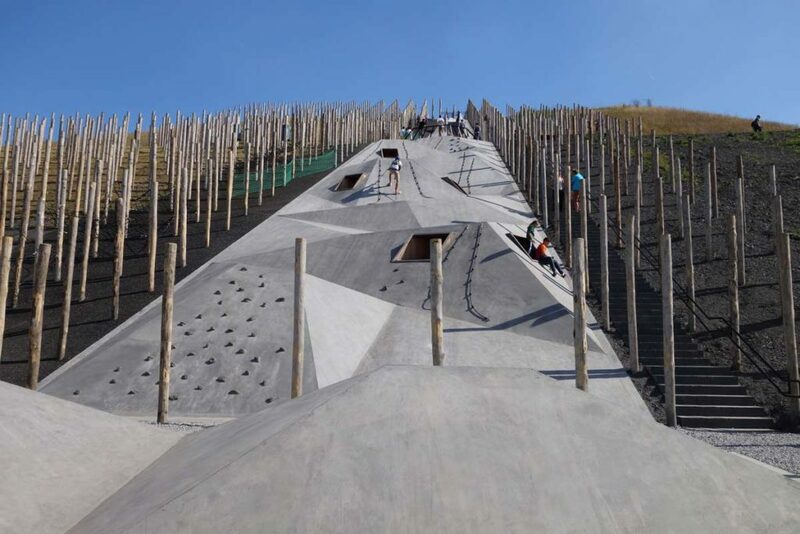 The adventure mountain is part of the touristic, recreative project be-MINE, that aims to breathe new life into the monumental coalmining site in Beringen, the largest industrial-archeological site in Flanders. 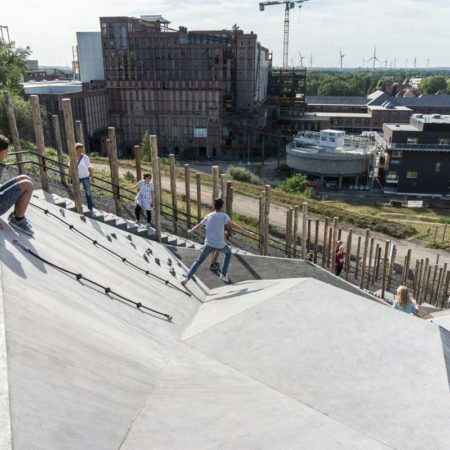 The former mining city asked to add a new function to the 60 meter high rubble mountain, and to redevelop the old industrial buildings into a cultural hotspot where its history can be experienced in a playful way. 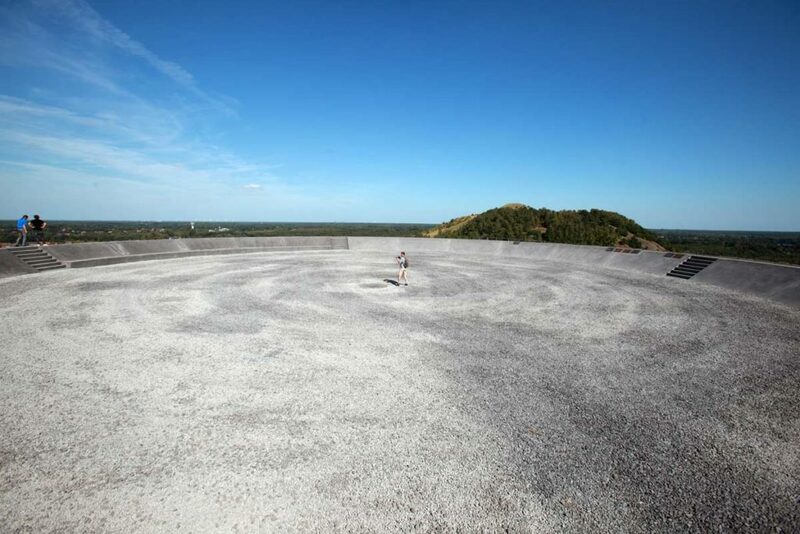 The spectacular scale of this site – regarding both the height of the terril as well as its industrial heritage – is unique in the relatively flat surrounding landscape of Limburgian-Flanders. 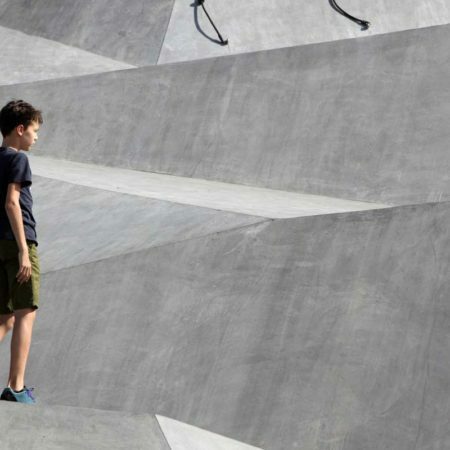 The intervention is a landmark on a large scale, but through its playable character it also reflects the small scale of a child. 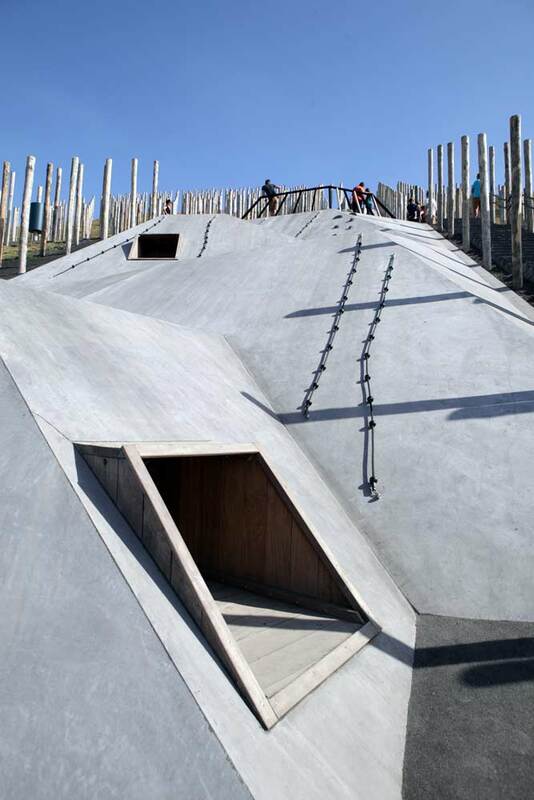 The values of the industrial heritage have been a continuous leading theme in the design process that resulted in an unprecedented playscape. 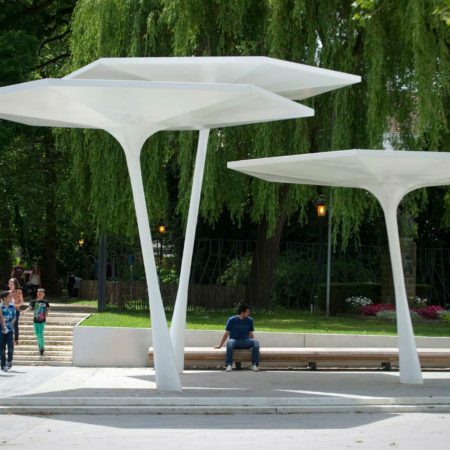 The mining ‘terril’ has been given a new meaning, rooted in both the past and the future. 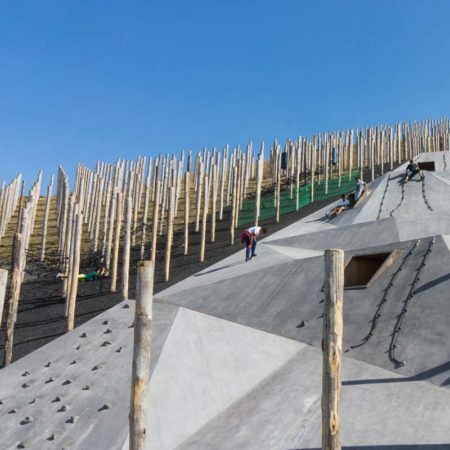 The design consists of three parts, that create a unity with the mountain and its past: a pole forest as a landmark, an adventurous prismatic play surface on the flank of the mountain and a coal square on the top of the ‘terril’. 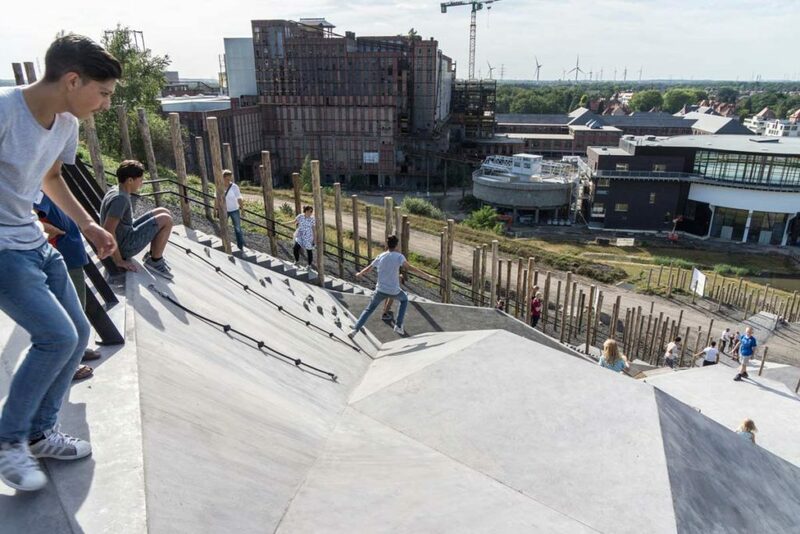 The spine of the ensemble is a straight stairs that provides access to all levels. 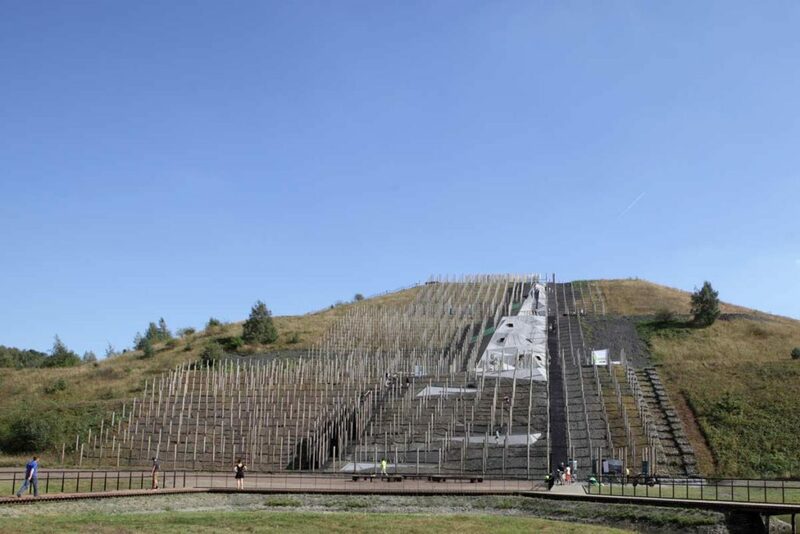 At night, a light line along the stairs makes the topography of the terril visible. 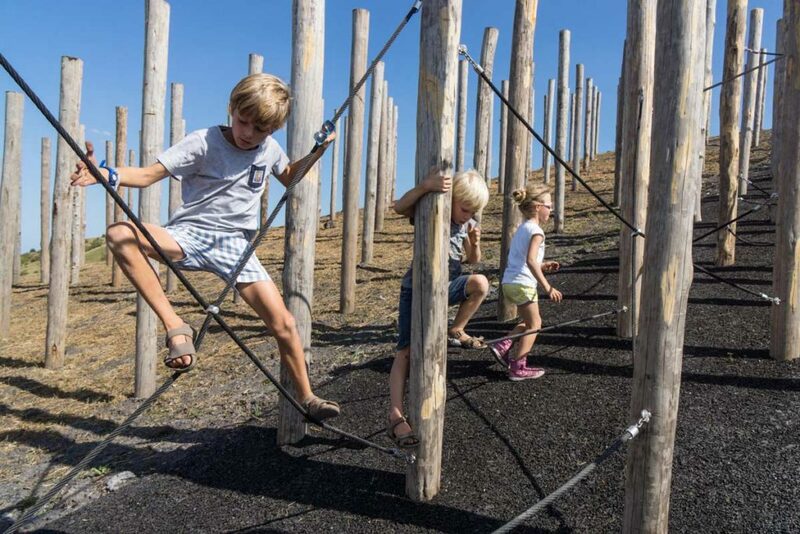 Wedged in between the pole forest lies a large, prismatically shaped play surface. 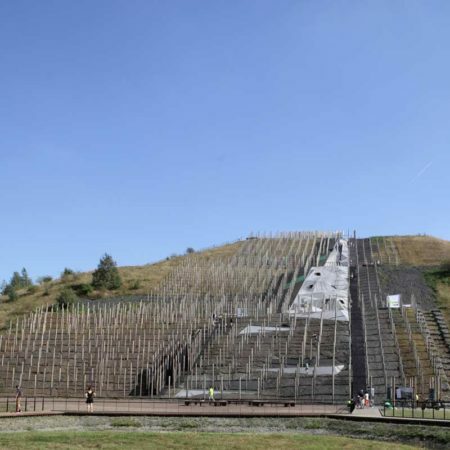 It has been ‘draped’ over the terril, following its heightlines – a gesture that is visible from afar. 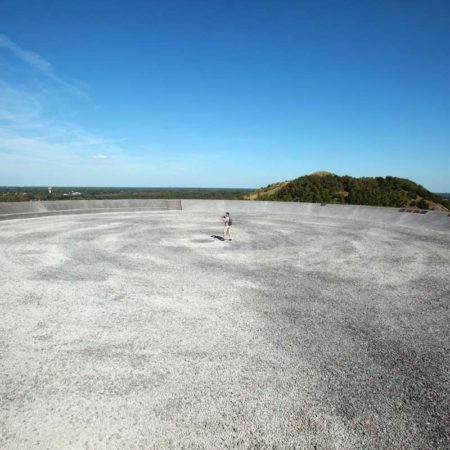 The surface is a challenging object, that narrows down to the top and ‘crumbles’ at the foot of the hill. 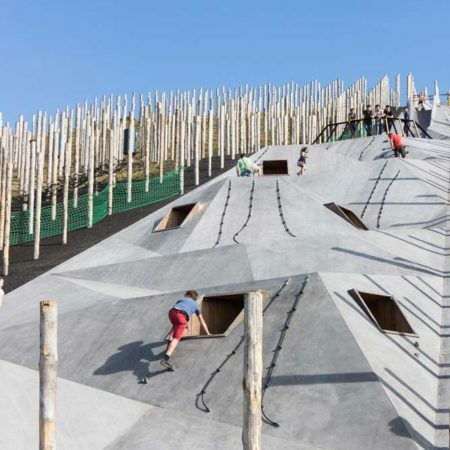 This tectonic landscape offers space to an endless variation of play options, and is scattered with crawling tunnels, climbing surfaces with climbing grips and ‘giant stairs’. 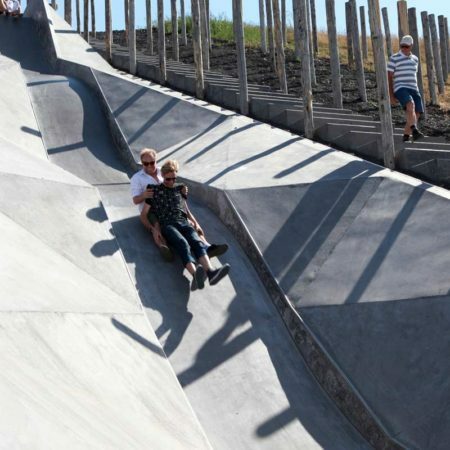 Its spectacular highlight is the more than twenty meters long slide, which is placed halfway up the hill and is integrated within the relief of the concrete play surface. 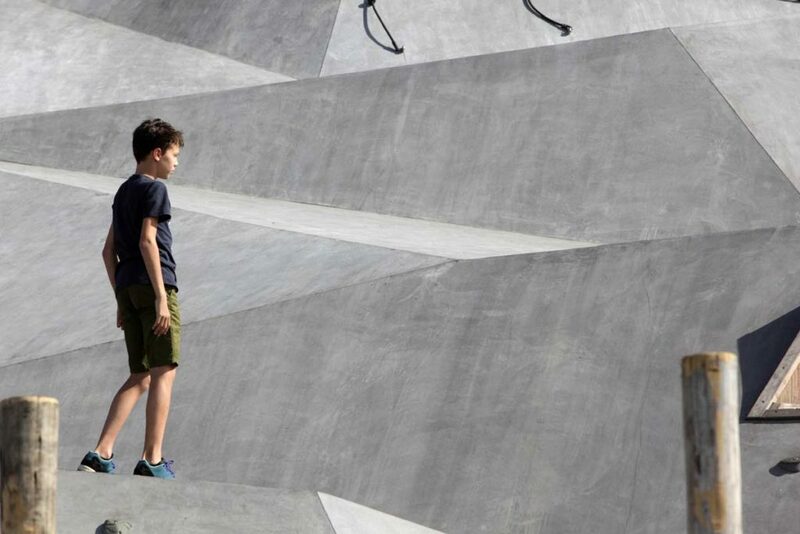 The various prismatic surfaces invite children to climb, slide, hide and discover. 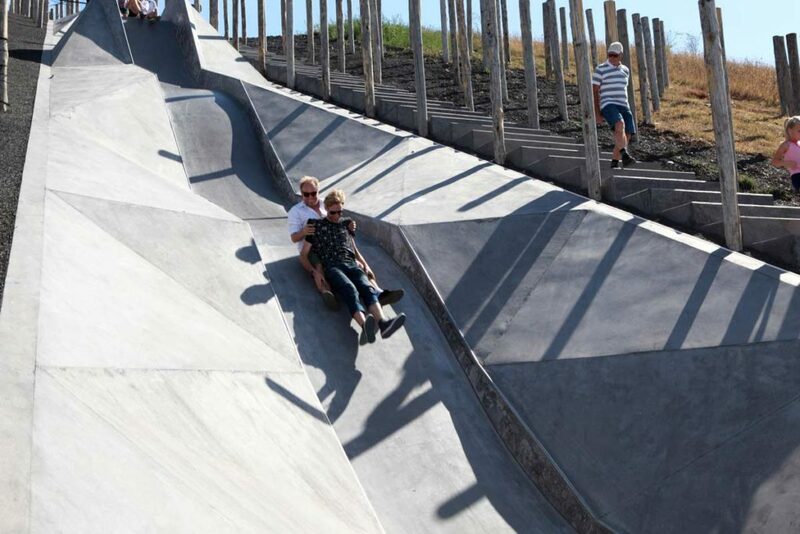 The surface consists of sloped, horizontal and vertical crossings, inspired by the underground mining shafts. 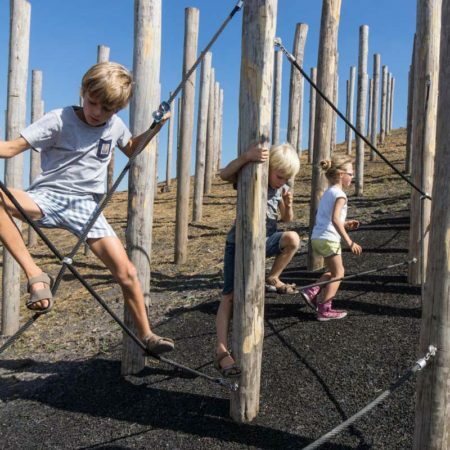 All integrated playelements in both the pole forest and the prismatic playsurface have one thing in common: they challenge children physically, to play together and use their motor skills. 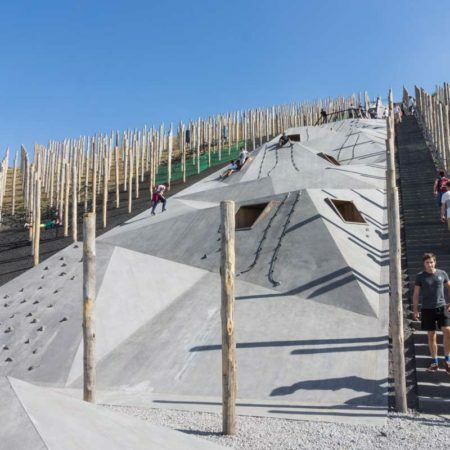 The sensation of an increasing height and difficulty level of the ‘parcours’ – the higher you climb, the more difficult it gets – asks for collaboration and mutual encouragement, until one reaches the top. 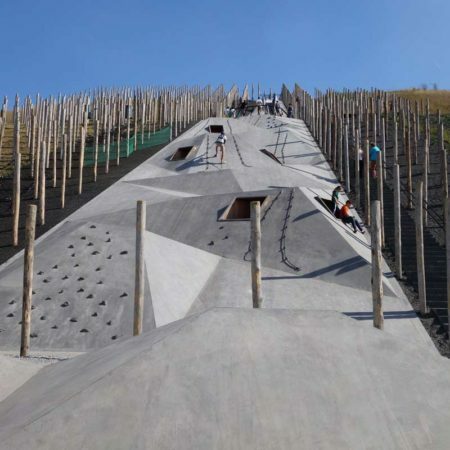 Cooperation and stimulation are therefore intrinsically connected with the play experience, as an immaterial reference to the hard physical work of the old mine-workers, who had to trust one another unconditionally. 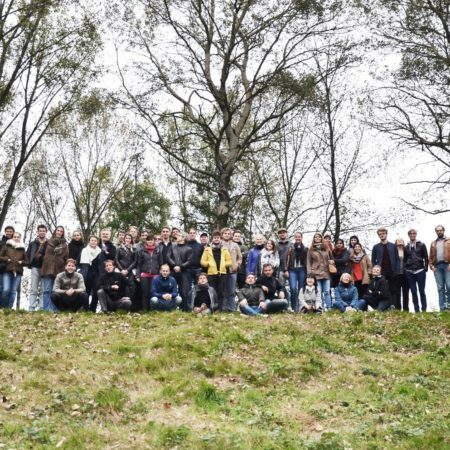 On top of the terril, at sixty meter height, a ‘Coal Square’ was created that reflects both the past as the present character of the terril. 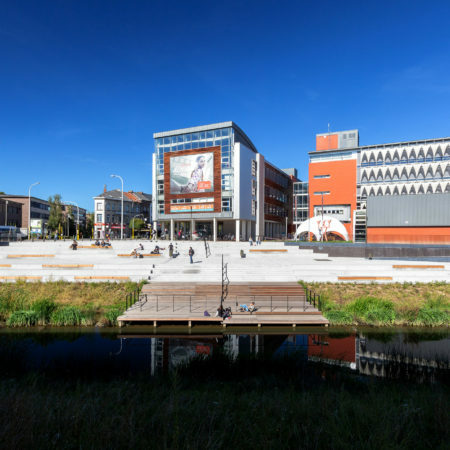 The square is sunken and visualises the presence of the ‘black gold’. 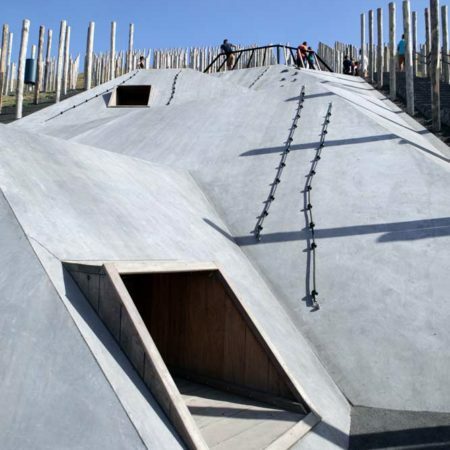 Its sunken position provides shelter from the strong winds at the top of the hill. In the middle of the square the horizon will not be visible anymore, directing full attention to the clouds above. 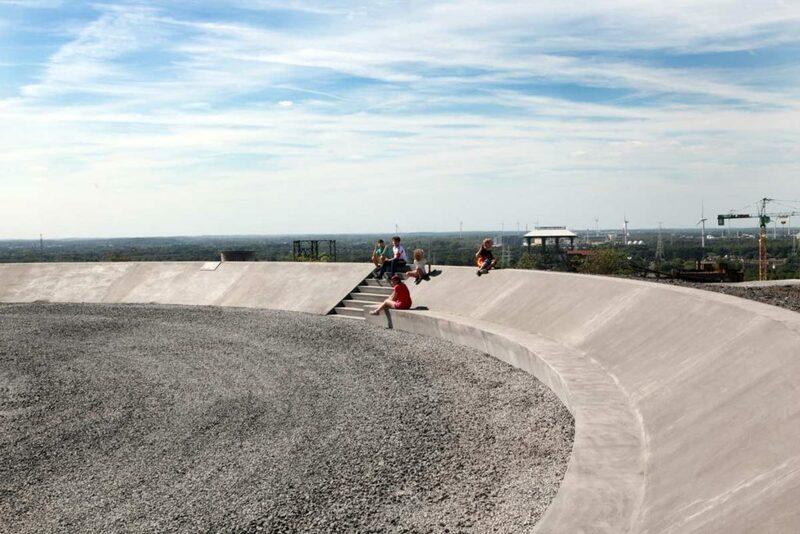 The sloped edges of the Coal Square can be used for seating and contain historic information on the site and the surrounding mining landscape. 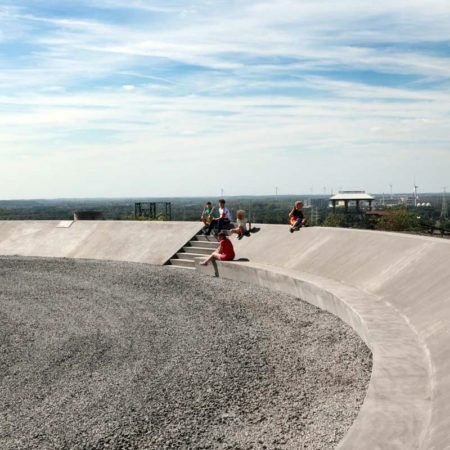 Visitors can take a stroll on the raised talud and enjoy the panoramic views on the surrounding Limburg mining landscape. 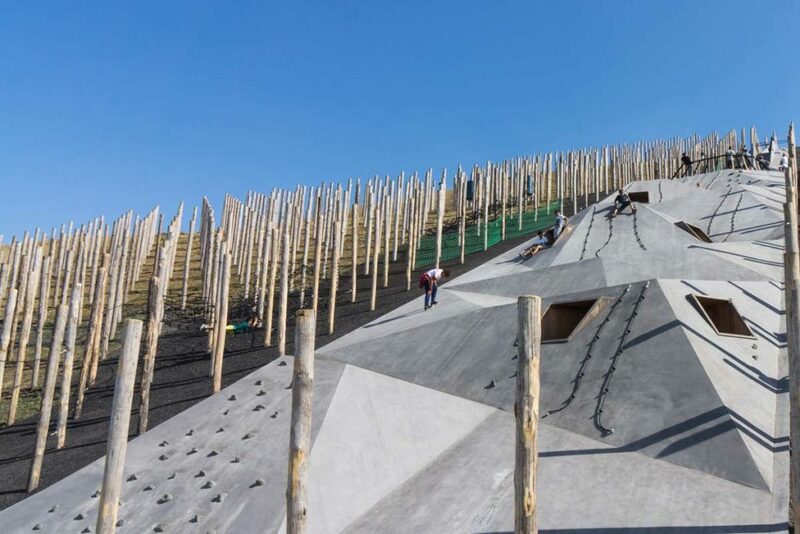 Together, the pole forest, the prismatic play surface and the Coal Square create a unique addition to the Masterplan Adventure Mountain, drawn by Antea Group, and are a valuable contribution to the transition of Flanders’ largest industrial heritage towards a touristic, recreative project. 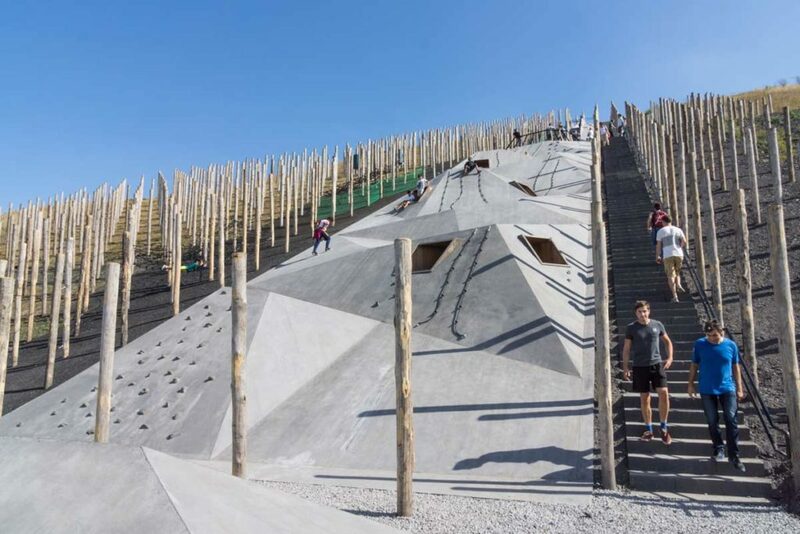 On the 9th of September 2016 the Adventure Mountain was festively inaugurated.